What if you could see exactly where you’re going before you ever make the first incision? Even better, what if you had all of this information right at your fingertips? 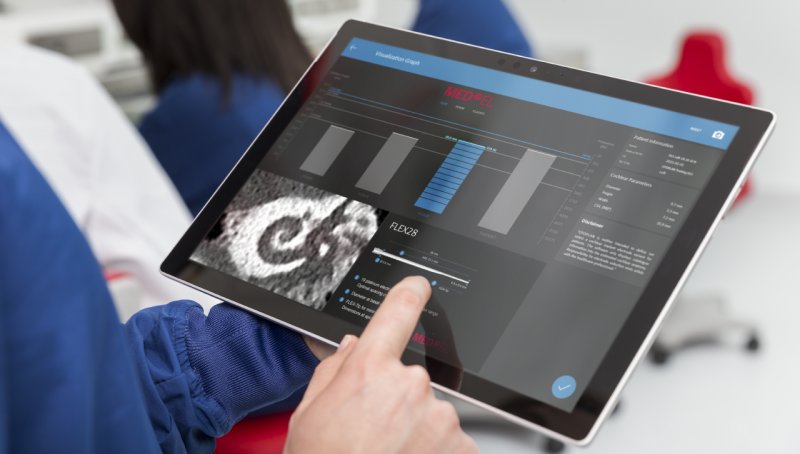 Today, we are excited to announce the launch of OTOPLAN, a revolutionary new planning platform for otological surgery. OTOPLAN has been developed by CAScination, who are leading innovators in the field of image-guided surgery and robotic surgery. With OTOPLAN, you can quickly generate patient-specific 3D reconstruction from medical images and easily visualize each patient’s unique anatomy—including optimal MED-EL electrode array for each individual candidate. And it’s all on an incredibly intuitive tablet-based platform. Let’s take a quick look at what OTOPLAN has to offer. OTOPLAN excels in the fast-paced world of modern medicine. OTOPLAN is a completely portable tablet-based solution, giving you exceptional mobility and flexibility. Whether you’re at your desk or on your way to the OR, you can always have OTOPLAN at your fingertips. Intuitive touch controls make it easy to control OTOPLAN and select exactly what you’re looking for. OTOPLAN makes it simple to manage patient data. 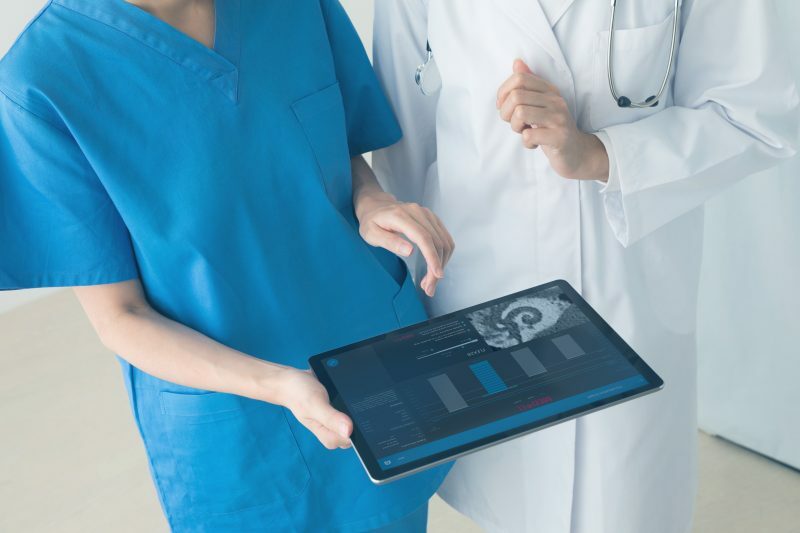 You can quickly import CT & MRI images wirelessly through your clinic’s PACS server or automatically import patient files from USB flash drive. This optimizes clinical workflow and supports highly-efficient flow of patient data across departments. Drag & drop controls make it easy to manage & update patient files. Ready to step into the future? 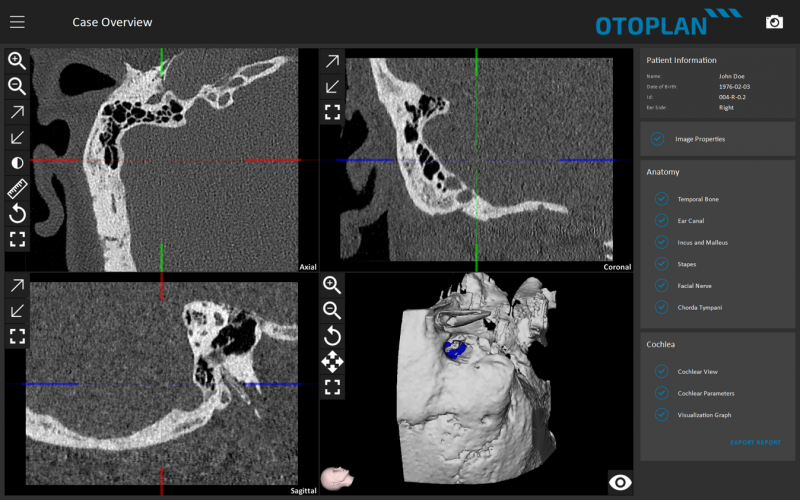 OTOPLAN automatically generates detailed 3D reconstructions from CT or MRI scans. With just a few swipes of your finger, you can create 3D renderings key otological structures. There’s even an option to export the 3D renderings to 3D model printing software. Think of the possibilities: You can easily navigate through the temporal bone, chorda tympani, facial nerve. Rotate 360° in any direction, zoom, change transparencies—touch screen controls make it simple to see incredibly detailed patient-specific 3D reconstructions. OTOPLAN lets you see exactly where you’re going before you ever make the first cut. OTOPLAN isn’t just highly detailed—it’s also simple to use. The guided workflow walks you through each step of the planning process. This makes it easy to generate detailed 3D reconstructions and calculate cochlear parameters with minimal effort. It can be challenging to get the best view of the cochlea with traditional image analysis. If you can’t get a top-down view of the cochlea, it can be difficult to make exact cochlear measurements. 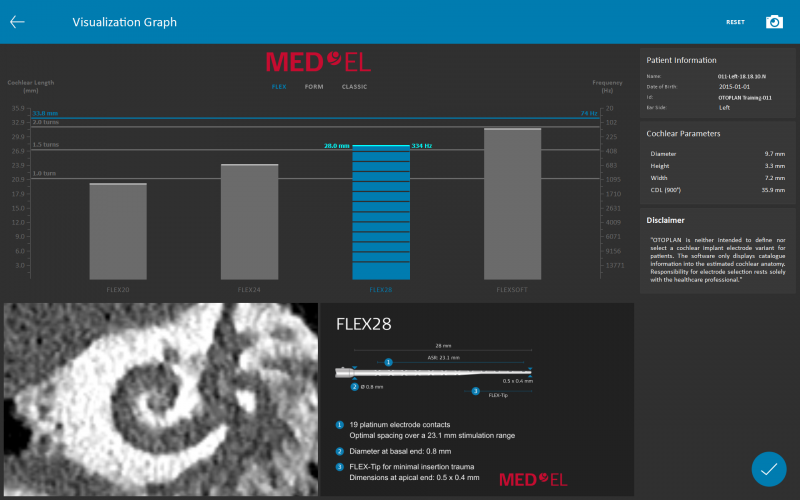 With automatic 3D reconstruction, OTOPLAN makes it simple to obtain an ideal view of the cochlea. Simply rotate the viewing axis until you get exactly what you’re looking for. This top-down viewing plane makes it easy to obtain consistent cochlear measurements—including basal diameter and cochlear length. Every cochlea is unique, so when it comes to electrode arrays, one size does not fit all. For the best hearing performance, you should have an electrode array that utilizes as much of the natural cochlear potential as possible. With detailed measurements from the cochlear view, you’ll be able to easily see how well each MED-EL electrode array could match the specific parameters of each cochlea. With one touch, you can compare insertion depth and quickly see the tonotopic center frequency at each electrode contact. This makes it simple to visualize the optimal electrode array for each patient’s specific needs. You can also use this to help you show your patients the difference between electrode arrays. 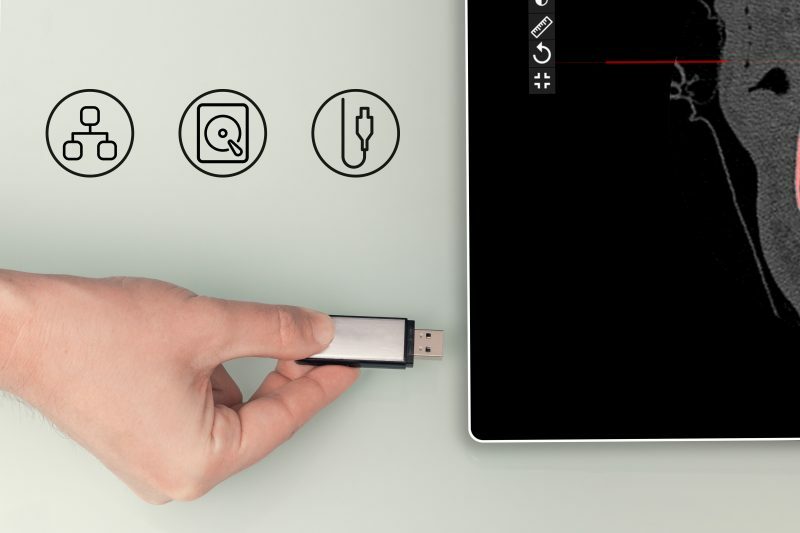 OTOPLAN is designed for collaboration and data sharing. With one step, you can export detailed patient reports as pre-formatted PDF or PowerPoint presentation. This simplifies documentation, order processes, and allows you to easily discuss case details. What are experienced surgeons saying about using OTOPLAN? "This will be a turning point—a turning point in the field of individualized medicine." Prof. Dr. Paul Van de Heyning shares his in-depth experience with OTOPLAN & the incredible potential of individualized cochlear implants. Don’t miss any updates, make sure to subscribe to the MED-EL Professionals Blog! Want to know how to get OTOPLAN in your clinic? Let us know with our simple contact form or contact your local MED-EL representative for details. You can also sign up at otoplan.ch. *OTOPLAN is currently approved for countries accepting CE-Mark. Features subject to change. Not all products, indications, and features shown are available in all areas. Please contact your local MED-EL representative for more information.